Posted on December 7, 2016 at 6:06 am. 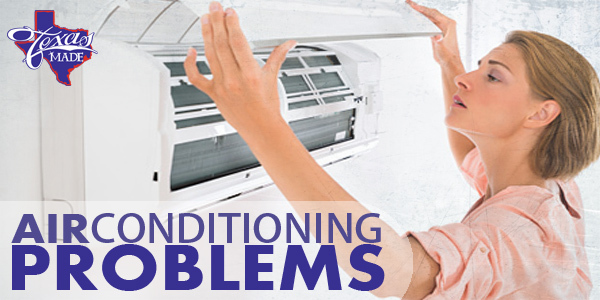 In Granbury Texas, Texas Made can assist you with any problems your air conditioner experiences. Our trained technicians are on call to diagnose issues and present you with solutions. Some of the most common problems that your HVAC system can encounter are as follows. Low refrigerant can mean your air conditioner needs to be recharged which in turn can imply a leak or a larger problem within your refrigerant system. Low refrigerant can even cause your coils to freeze. It is important to have a leak located and repaired. Refrigerant is a chemical best handled by your air conditioning specialist. If you have an older HVAC system, faulty wiring that has become loose and frayed can become a fire hazard, trip your circuit breaker and even stop the system receiving power. If your system is newer, but it wasn’t installed properly or by a trained professional, the wiring may not have been hooked up correctly. If the outside component is experiencing trouble it may not be receiving power, or it could be associated with a thermostat that isn’t working correctly. Another common problem is an outside fan malfunctioning, the fan moves the heat from your residence to the outside. If the fan isn’t working, the air conditioning compressor can overheat and this in turn will trip the safety overload. Be sure to always keep debris away from the outside unit, clean up all leaves, grass and dirt surrounding it at least once a month. Last of all, be sure to replace your filters so return air ductwork doesn’t become obstructed with dirt.